One-room schoolhouses were a common sight in the 19th century American West. Although most have been allowed to fall into a state of disrepair, there are still some left that have been restored through the time and effort of members of the local community. One such school house can be found off of South Prairie View Road in Waverly, WA. 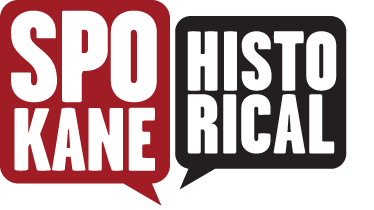 In fall, 2013, the Southeast Spokane Historical Society, with the help of thousands of dollars in private donations, made an attempt to restore and conserve the old school and also sponsored the school's five-mile move to its current location. Prairie View School has served as a staple of Waverly's community history and culture for 110 years. The Prairie View schoolhouse opened in 1904 and stood at Fenn and Waverly-Plaza Road to serve and educate area children in grades K-12, but it was not the town's first. Beginning in 1881, the area opened its first schoolhouse, a simple log cabin structure. A few years later as the growing population of Waverly had outgrown the old log building, the town constructed Prairie View. Walter Stark served as the school's principal for the first few years and Annie Holtman was the school's teacher from 1923 until 1961. Local historian, Glenn Leitz, believes the building was originally a pioneer home before it was turned into the new school. Before it closed its doors in 1937, as many as 30 to 40 students attended Prairie View during any given school year. 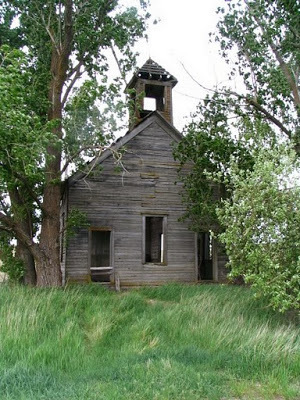 The schoolhouse sat nestled among some cottonwoods in a very sad state. In 2013, the Southeast Spokane historical Society had the building lifted from its original foundation and transported approximately five miles to its current location. It now sits on a recently poured concrete foundation and a new roof has been put in place. From the outside, the school looks relatively new due to the recent remodel and the original clapboard siding still remains, which is still in remarkably good condition. 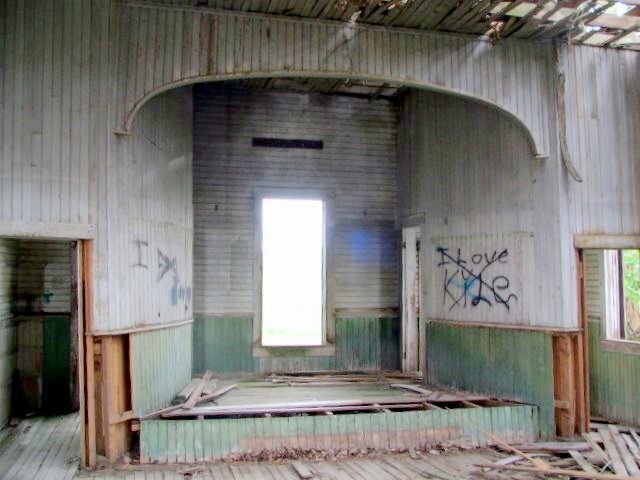 Other than the new roof and foundation, the inside of the school has maintained much of its original character, including the stage. The process of moving and restoring the old school has, as of 2013, totaled around $50,000.00, all of which has been funded through generous donations. Similar schoolhouses could once be found dotting the Palouse landscape in both Spokane and Whitman Counties. As early as 1927, there was 130 one-room schools just in Spokane County alone. Waverly's Prairie View Schoolhouse is one of a small number in which the local community has made the push beyond talk and began a concerted attempt to preserve it. Waverly's Prairie View Schoolhouse stands as a testament to the importance of public education to the residents of the Northern Palouse. Prairie View Schoolhouse, 2014: A look at the recently remodeled schoolhouse in Waverly. It is still a work in progress, but it is still in fairly good condition. 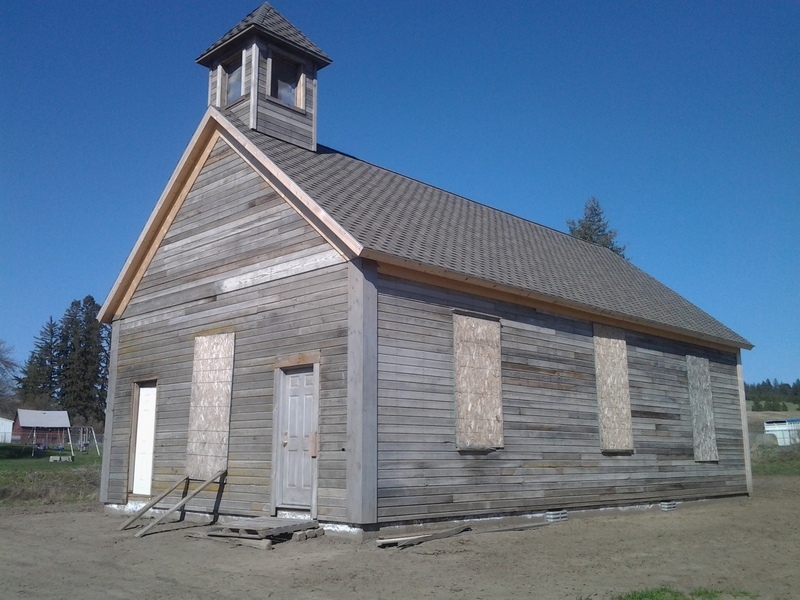 Other than the roof and new doors, the outer construction of the old schoolhouse has maintained its original construction. Image by author, 2014. 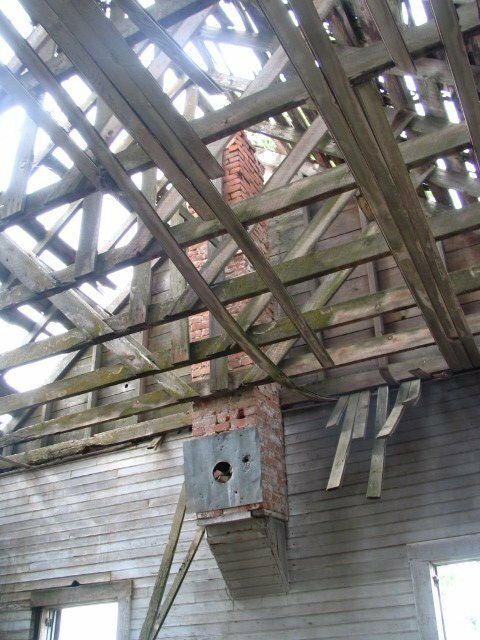 Pre-renovation Roof, 2012: The roof was all but gone when area residents began to make preparations for the move. The roof has since been replaced with a new one and the school is now protected from the elements. Image courtesy of Larry Cebula, 2012. Remodeling Prairie View School, 2014: A look inside the renovation project. 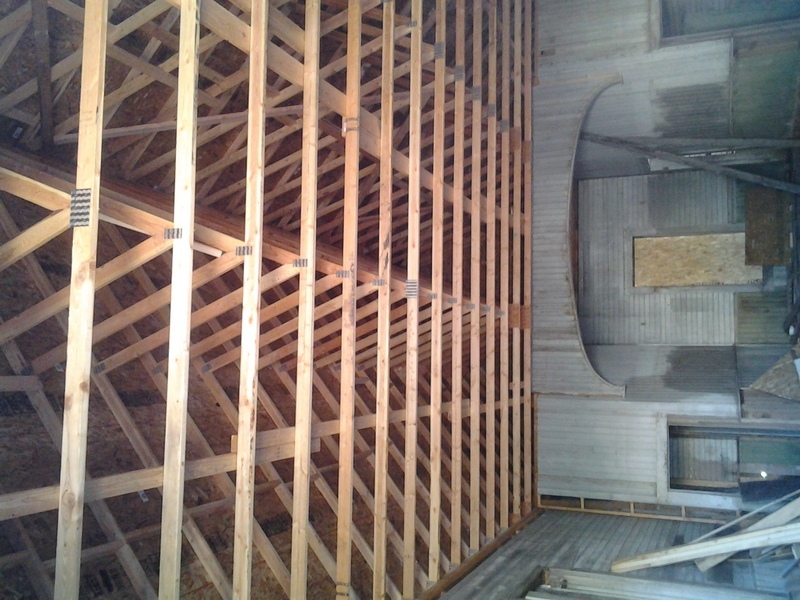 The ceiling joists, along with the roof, are the most visible of the remodel that began in 2013. Community volunteers and donated funds have, thus far, helped to make this a nominally successful venture. The renovators have used as much of the original materials as possible I order to maintain its original integrity. Image by author, 2014. A New Roof, 2014: Other than the physical moving of the building to its current location, the most costly aspect of the renovation project has been the new roof and ceiling joists. The total costs incurred so far has reached around $50,000.00, all of which was donated by individuals. Image courtesy of author, 2014. Prairie View School Before the Big Move, 2012: The schoolhouse sat among some cottonwoods a few miles away from where it currently resides. Environmental damage, along with random acts of vandalism were beginning to compromise the integrity of the old building, which helped precipitate the move in 2013. Image courtesy of Larry Cebula, 2012. 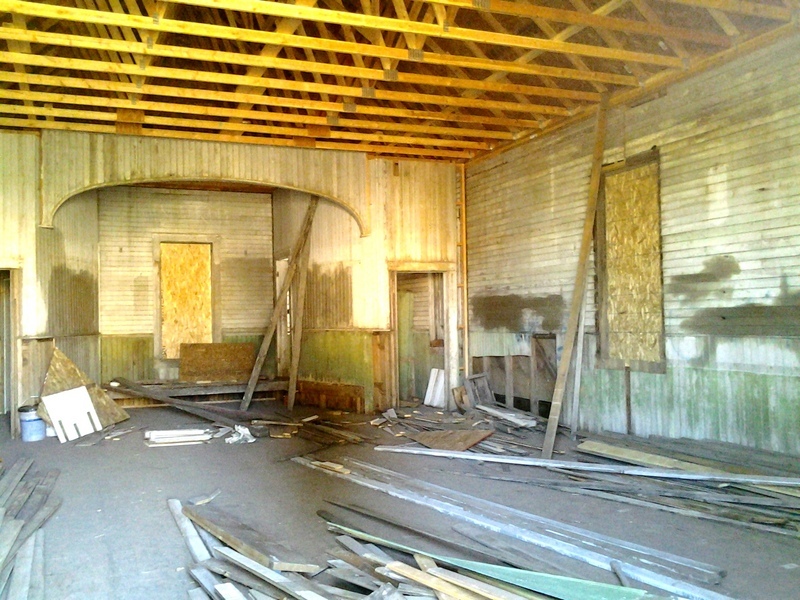 The School's Stage, 2012: Before the schoolhouse was moved and the renovation began, this is what the inside of the building looked like. Vandalism (as seen in this photo) had become a big problem for concerned residents who wanted to see the building preserved. The stage was an important part of the school and remains a big part of the current remodel. Image courtesy of Larry Cebula, 2012. Robert M. Lambeth, “Prairie View Schoolhouse in Waverly,” Spokane Historical, accessed April 20, 2019, https://spokanehistorical.org/items/show/436.